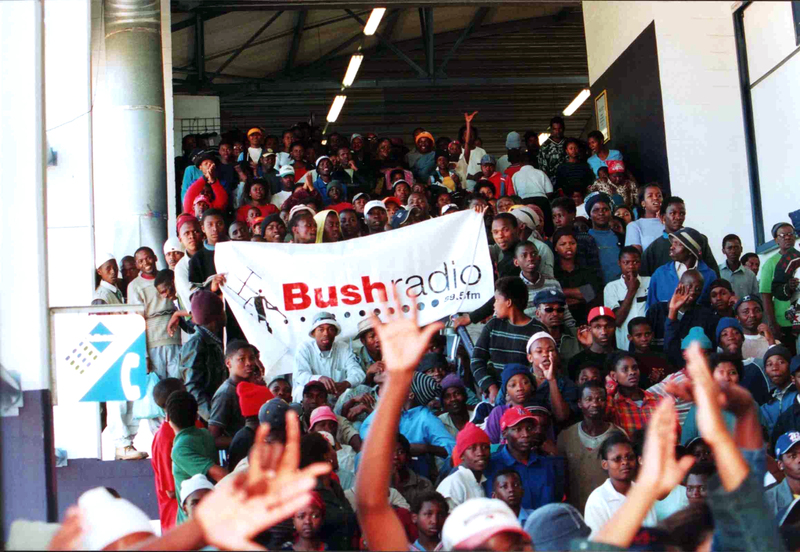 Bush Radio was officially formed in 1992, after two years of community consultations of all aspects of the radio station. After repeatedly applying for a broadcast license to the apartheid government in 1992, Bush Radio then decided to broadcast illegally. The response of the apartheid government was to confiscate the transmitter and other equipment, and to arrest and charge the Chairperson of the Board, Mervyn Swarts, and the Co-ordinator, Edric Gorfinkel to the full extent of the law. 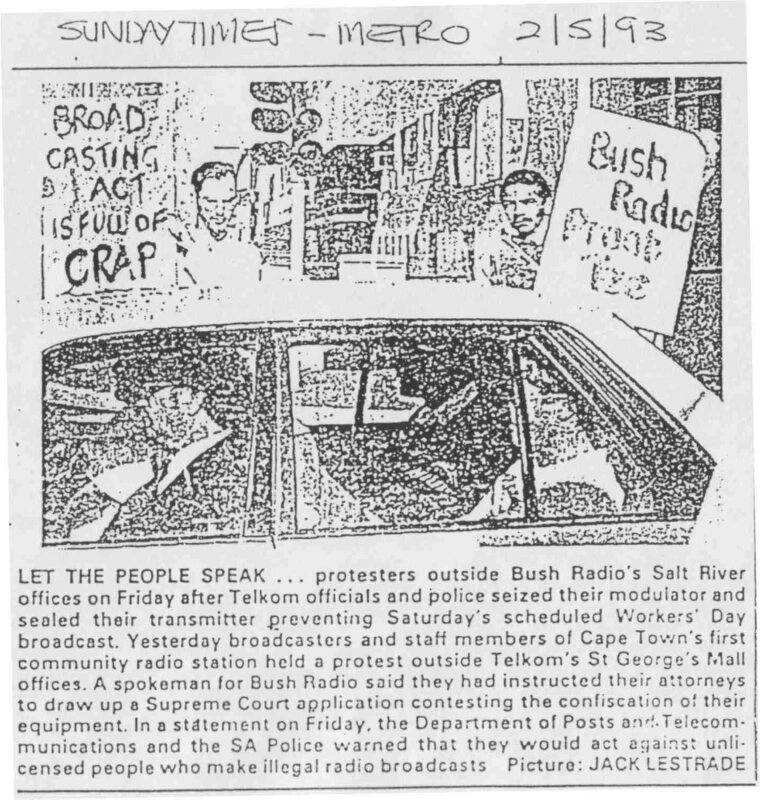 Bush Radio members and volunteers organised placard demonstrations calling for the dropping of all charges, as well as the establishment of an “independent authority” to regulate broadcasting in South Africa. After a year of court hearings, the apartheid government dropped the case. After the first democratic elections in 1994, the new government established the Independent Broadcasting Authority (IBA) to regulate broadcasting in South Africa. Bush Radio was then issued with a one-year temporary license on the frequency 89.5FM, sharing the frequency with another radio station. The one-year temporary licenses were intended to be a temporary measure until the IBA was ready to issue four-year permanent licenses. However, this process took far longer than anyone anticipated. Bush Radio was issued with a four-year permanent community radio license in July 2002 and another four-year licence in 2006. Since then, Bush Radio has been broadcasting for 24-hours a day, seven days a week. “To ensure that communities who have been denied access to resources take part in producing ethical, creative and responsible radio that encourages them to communicate with each other, to take part in decisions that affect their lives, and to celebrate their own cultures. Through such radio, communities will affirm their own dignity and identity, and promote social responsibility and critical thinking”. 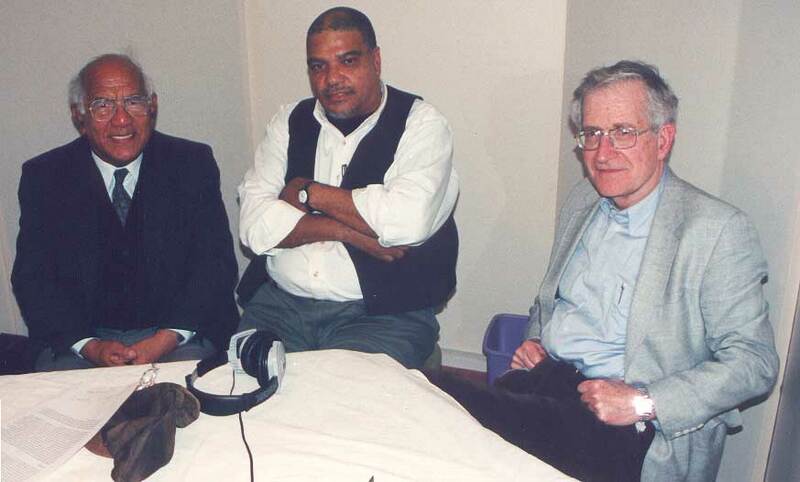 * Noam Chomsky is an American linguist, philosopher, cognitive scientist, political activist, author (Manufacturing Consent etc), and lecturer. He is an Institute Professor and professor emeritus of linguistics at the Massachusetts Institute of Technology (MIT). Bush Radio is broadcasting 24 hours per day seven days per week. Our programming is summed up by a quotation by Jim Ellinger, who visited the station from the USA. “I have visited scores of community media groups around the world (100+ cities in 40+ countries/territories since 9/11), and few compare with the great resource provided by Bush Radio to the Cape Town community. Programming in three local languages, Xhosa, Afrikaans and English, with half of the programmers women, the station reflects and promotes the best of the city. It also covers the myriad of social and political issues still facing post-apartheid South Africa”. Bush Radio currently has 23 upliftment projects, ranging from the CREW programme to the Schools HIV and AIDS Education Project (SAEP). Bush Radio stuck to its activist and social starting point and became more than just a radio station. All our on-air programs are linked with off-air activities. For example the children’s program grew into a continuous educational workshop for youngsters in the age range of 6 to 18 years, and includes the on-air component as well as a homework program, teaching English as a second language, and a lifeskills program. The HIV/AIDS programmes are linked up with educational workshops at schools where we visit two schools a week and raise awareness around HIV and AIDS. We have a collaborative partnership with the South African Red Cross Society were both organisations go into the townships and raise general awareness. Our Hip Hop music program was the starting point of a formidable curriculum for Hip Hop musicians who want to improve their ability to write meaningful lyrics on HIV and AIDS and other social issues relevant to their age group. 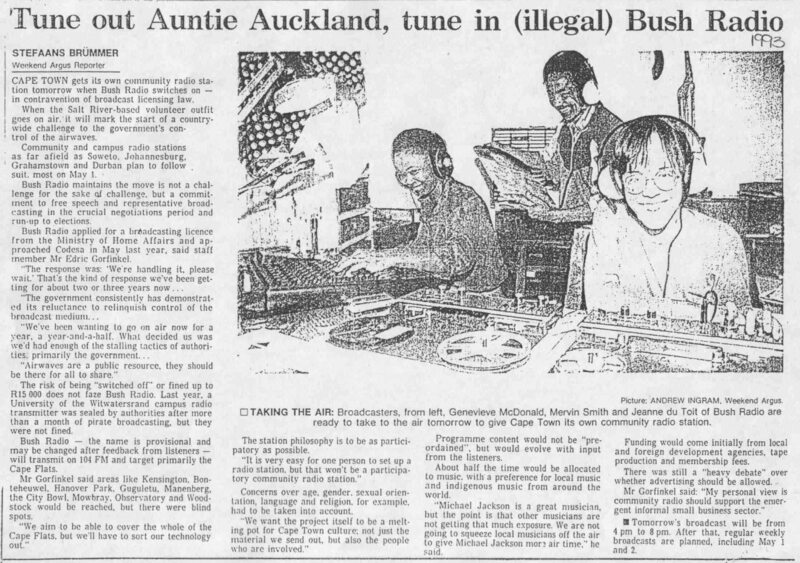 Bush Radio, furthermore, started a crèche on its premises to provide young mothers who work in the factories nearby with the possibility to continue employment. Watch a clip on a training project Bush Radio is part of: The third activity of Bush Radio is the scholarships and training programme. Each year, Bush Radio gives scholarships to poor students that have the potential to succeed. Although the scholarships are mostly for journalism students, we have given bursaries to students in other fields. The forth activity of Bush Radio involves the development of the human being from birth to old age. Bush Radio operates a day care centre for children from the ages of 3 months – 2 years. This day care is open not only for Bush Radio staff, but also for people working or living in the area surrounding Bush Radio. The CREW programme for children aged 6 – 18 years old demystifies radio and media to them, so that they are critical media consumers. The Alternative Kurriculum Mentoring Youth (Alkemy) programme is an alternative programme for youth (18 – 24) and educates them about political issues, starting from the foundation such as what is philosophy to reading and analysing “The Alchemist”. These are but a few samples of our human potential development programmes. Bush Radio operates with a small staff of 5 members, 10 trainees (fluctuates), interns from local and international universities and over 100 volunteers. The staff and trainees are responsible for the implementation of the weekday programmes (6:00 – 16:00), while volunteers do all the programming as from 16:00. During the weekend, the picture is different as all the on-air presenters are volunteers that offers their time to do these programmes. The annual general meeting is once a year, and elects the Board of Directors. The Board’s role is to oversee the implementation of the policies, identify gaps and do development of the policies, fundraising and providing advice on legal, financial and other matters. Bush Radio has a monthly Open Forum, which is open to anyone within the community that wants to hear what is happening at Bush Radio. Community members can also make suggestions and recommendations on improvements, critique any aspect of the station that they are unhappy about or even to complement staff on a job well done. The Managing Director is the link between the staff and the Board, and, with the staff, is responsible for the daily operations of the station. Volunteers form the backbone of Bush Radio, as they run most of the weekday, and all the weekend programmes. Bush Radio has diverse sources of income. Advertising forms about 50% of income, but Bush Radio does not accept advertising from alcohol, gambling companies, neither will Bush Radio accepts advertising that is racist, sexist or discriminatory in any way. Sponsorship for programmes is another source of income, but no sponsorship of news is accepted. Donors / grants provide income for some of the social upliftment projects such as CREW, our Media Kidocracy Konference (annual) and the School HIV and Aids Education Project. Other sources of income includes: fundraising, selling of merchandise, training fees, internship fees and service provided, which includes Outside Broadcasting, admin and management fees for projects. An undeniable boost has been the international recognition of the importance of the work done. Bush Radio carries some of this recognition with particular gratification: the Prince Claus Award for Urban Heroes that it received in 2000 through its Executive Director, Zane Ibrahim, and the second prize (silver medal) in the New York International Radio Festival for a CD of HIVHOP songs (Hip Hop on HIV/AIDS) that was produced in collaboration with Radio Netherlands, in 2001. Bush Radio also received two awards from the Department of Communication in 2005 for Best Provincial Achiever and Best Logistics department, and three awards for quality journalism from the SABC Community Media Awards. Great new website. Easy to use. Congratulations! Hi i am a 22 year old male who has just completed a sound engineering course and i am interested in working in radio some of the sofwares that we dealt with at the college namely: Cubase-mixdown and recording, Reason- jingles voice-overs, Protools- mixdown and recording etc. We also touched on various other aspects of sound and studio recording etc. I was wondering if there are any vacancies. My availability is flexible whether it is part time, full time, an internship or even freelancing. Bush Radio is a volunteer driven radio station so people give their free time but it is also a good place to get some experience. Please keep checking our blog fpr interning or volunteering opportunities. Good luck with your career and remember to send us demos of your work. I need a contact from BUSH RADIO. It’s urgent. Can somebody help me? This is an amazingly informative and well-structured “about” page – it was interesting reading about the history and origins of Bush radio as well as the role it plays today. Not many sites I’ve come across have had such accessible and complete information, so this is great! Im a 22 years old boy ive got a grade 11, im interesting to work as a radio presenter but i dont have any qualifications. Hi I’m a member of a kzn based hip hop crew aiming to make a positive impact in today’s youth, do you only operate in captown? We have an archive of vinyl which at this stage is not open to anyone – but intend selling off some of them but no concrete plans are in place yet. Otherwise our best suggestion is searching online to buy tracks. I believe you are looking for a receptionist. Where can I send my CV please. I have experience. I really love this bush radio program , but I just wanted to ask if they can also play mixtape songs from the radio. It is very exciting to see how the station has grown over the years. I can remember all those events that happened in 1993 as if they happened yesterday. To see all those people Edric, Taslima, lumko Mtinde when they confiscated the transmitter, our first broadcast on the 10 April 1993 when Chris Hani was assassinated it brings back happy memories……. Thank you guys you have done a wonderful work in preserving the history of Bush Radio. I would love to have a copy of “Partial Eclipse” and be intouch with all of you again. Luntu(for those of you who have forgotten me I am the one who is doing the first broadcast on the day Comrade Chris is assassinated. Best wishes to all the Bush Radio people from Germany. From time to time I listen to your program. This is my favorite radio station in the RSA (I listen to it via the internet). Keep on rocking. What a story! I am deeply touched – just watched Partial Eclipse. Now I’ll follow Bush Radio of today. (thanx www) I am very curious.